Wednesday 22nd August 2012, 6:30 pm. The Raspberry Pi went on general sale at the end of February 2012. It immediately crashed the websites of the suppliers chosen to take orders for it. The Raspberry Pi is a Linux computer complete with video output and USB connections on a board the size of a credit card and costing £25. On the other hand, Arduino is a similarly priced microcontroller board that is used by educators, hobbyists and artists to interface computers and smartphones with other electronic systems. It also finds itself embedded in art installations and controlling all manner of home made gizmos. It is a central part of the Open Source Hardware and Maker movement that empowers ordinary individuals to produce personalised products for themselves and others without the need for a high level of technical skill. In this talk I introduce the Raspberry Pi and Arduino boards, identifying their uses and demonstrating how each can play to its strengths by using a Raspberry Pi as the front-end to an Arduino board handling the electronics. This will be illustrated with live demonstrations of the devices communicating with each other. 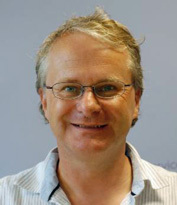 Dr. Simon Monk has a degree in Cybernetics and Computer Science and a PhD in Software Engineering. Simon spent several years as an academic (Lancaster) before he returned to industry, co-founding the mobile software company Momote Ltd. Simon is now a full time author and has published three books in the McGraw-Hill Evil Genius series, including Amazon’s top ranking Arduino book 30 Arduino Projects for the Evil Genius. He is also the author of Programming Arduino, as well as co-author with Paul Scherz of Practical Electronics for Inventors (third edition). He has also published books on IOIO and .NET Gadgeteer and is currently contracted to write Programming the Raspberry Pi.